From Los Angeles to the Pacific Coast of Mexico. Sign Up Listing JOEY KORN as your referrer and you’ll get a free Remote Spiritual Housecleaning Session with Joey, worth $200. Ports of Call: Our 7-night cruise begins in Los Angeles and sails to the beautiful Pacific coast of Mexico. Our Ports of Call include Cabo San Lucas, Mazatlan, and Puerto Vallarta. 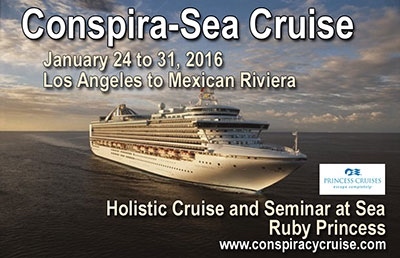 Join Us on the “Conspira-Sea Cruise”! Join Jill and me, about thirty other spiritually-oriented speakers, and hundreds of like-minded others on a wonderful cruise to the Mexican Riviera. While neither of us really follow conspiracy theories, we are sure we’ll meet a lot of amazing people and learn a lot in the process. We participated in the Spirit of Alaska Cruise this past June, and it was the experience of a lifetime. We expect this to be just as wonderful and inspiring. A Few of the Amazing Speakers: Sean David Morton, Dannion Brinkley, Jeffrey M. Smith, Joey Korn (yours truly), Andy Wakefield, Nick Begich, V the Gorilla Economist, John Greenewald, Mike Harris, Len Horowitz, Joshua Warren, Michael Badnarik, Winston Shrout, Sherry Tenpenny, Dean Ryan, Laura Eisenhower, Robert Strecker, Rosemary Guiley, Susan Shumsky, Kerry Cassidy, Toni Bark, and more! During this incredible, mind-blowing, truth-telling, spiritually enriching event, we will uncover the truth about things conspiratorial. Plus we will explore how to heal ourselves and others, and to attain self-mastery and greater integrity. The purpose of this cruise is NOT about being a victim of conspiracies. It is about taking back our power, discovering the truth, and taking command of our lives. 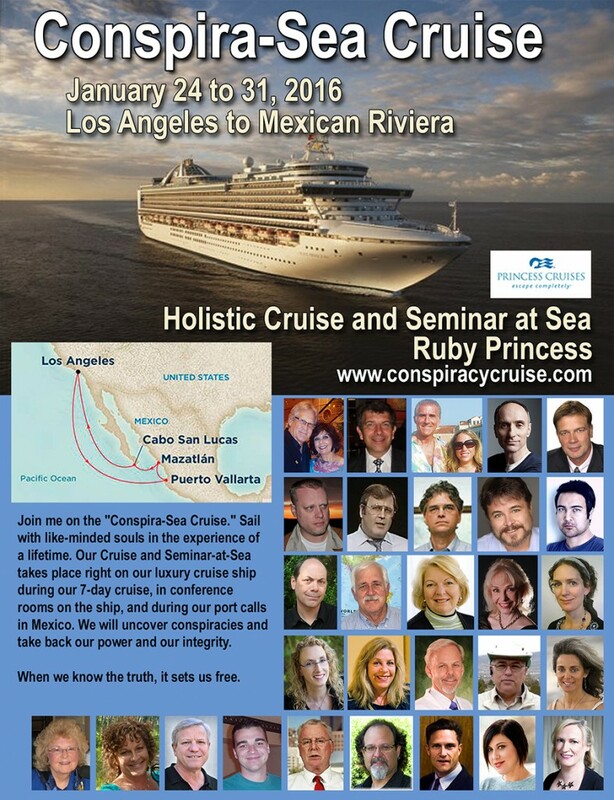 This cruise will not only uncover the lies; it will also show us the truth. As we dispel the darkness, and shine the light of wisdom, we enter the true light of consciousness. And we are set free. ALL are welcome to discover the real truth, together. SPECIAL BONUS: Beginning on Thanksgiving Day, November 25th, 2015, we will offer a free Remote Spiritual Housecleaning Session with Joey, valued at $200. When you register, please be sure to mention my name, Joey Korn, as your “Referral.” When you register, referring to me, you’ll receive a free Remote Spiritual Housecleaning Session with Joey, valued at $200. Just let us know. Posted on January 21st, by Joey Korn in Events, Featured, Latest News, Spiritual Dowsing & the Simple Blessing Process, Walter Russell.